The ongoing evolution of FocusTrack, the show lighting documentation system, sees the introduction of PowerTrack, a function for calculating the power consumption of shows. PowerTrack takes the information about the levels lights are at in cues, which it extracts by importing showfile data from ETC Eos/Ion, MA grandMA or Strand 300/500-series consoles, and combines it with information about fixture types and their power consumption that is available from the RigTrack rig management module. This means that it can calculate the approximate load of any given cue – in doing so taking into account not only the level that tungsten lights are at and the constant background load of discharge fixtures, but also the status of more complex fixture such as moving lights that reduce their discharge lamp’s output power when the mechanical dimmer is closed. 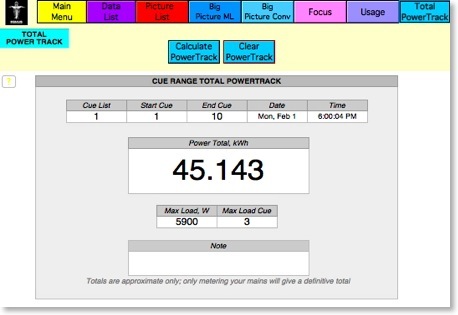 In addition to calculating the load cue by cue, FocusTrack can also calculate the overall power usage of a show. To achieve this, it can now learn the timing of a show’s cues during the course of a performance. Based on this timing information – the time in each state and the transition time from state to state, it can calculate the overall consumption of the show. PowerTrack was added to FocusTrack after requests from a number of theatres who were becoming required to track the power usage of their lighting systems for environmental audit purposes, but whose dimming systems are tied into the overall building power with no separate metering available. The system will also be of use to those taking large scale West End or Broadway productions and working to prepare them for tours, allowing a more precise guide as to the power required than previous ‘guesstimates’ or total connected load calculations. PowerTrack is now a standard feature of FocusTrack, available in the current version, 2.120, which can be downloaded from the FocusTrack website at www.focustrack.co.uk. FocusTrack is available for Mac or PC; it can be run in demo mode to allow its functionality to be explored. FocusTrack can be found on a wide range of shows around the world, including Billy Elliot worldwide, Come Fly Away, The Addams Family, Mary Poppins and Red in New York, Love Never Dies in London, South Pacific touring the US, and Cirque du Soleil’s Zaia. Further information about FocusTrack and its companion program SpotTrack, for producing followspot cuesheets, can be found elsewhere on this website. Further information about PowerTrack can be found here.